If you’re a fan of the Buena Vista Social Club, this guy’s gonna make them seem like a bunch of posers. 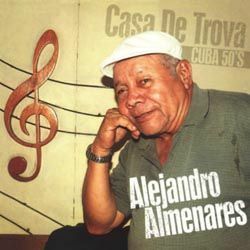 Composer, vocalist and tres guitarist, Alejandro Almenares delivers the real thing from Cuba here on this set. This double vinyl set contains the same songs (although in different order); the difference is that the first features his rich and full voice, while the second features his material as (mostly) instrumentals. Flutes, percussion, violin, soprano sax, guitars and intermittent vocal choruses accompany Almenares on the gentle and fragrant instrumental takes of “No Critiques Al Nene” and “La Nina Que Yo Ame”, while vocalists Tony Rodon, Eva Grinan, Jose Cabrera and Ismael Borges deliver tales of passion on “Mujercita “Linda”, A Tu Retrato”, “Te Vi Y Te Contemple” and “De Lo Que Quiero Saber” respectively. The simplicity of the old world charms are on abundant display here. No gimmicks, no frills, just earnest notes and, like the best of cooks, letting the simple ingredients do all the work in creating the flavor that makes your mouth water. Essential listening! La Casa de Trova. The house of the troubadours. It’s a place of almost mythical status in Cuban music, the home of so many of the glorious songs that have come out of the island. Even Paul McCartney has made his pilgrimage there. For Alejandro Almenares, it’s a place he visits every single day, still carrying his guitar as he goes to play and talk with friends. And it’s the inspiration behind his album “Casa De Trova” (Tumi Records: release: February 25, 2014). For Almenares, the connection to the house is deep. His musician father, Angel Sanchez Almenares, was one of the founders of the Casa.